so RSVP Now to Hold Your Seats!! It will be so much fun to have you there! And seeing you at the show! Back by popular demand, Loveswell (Part II), is the hilariously intimate one-man show about a man fighting for his relationship in the first year of having a baby through the ups and downs of marriage as seen through the eyes of a surfer. The show—written and performed by John Fortson and directed by Terrie Silverman—is their second successful venture together. Their first venture, Loveswell (Part I), also dealt with relationship, but without the baby, instead diving deep into dating and marriage. 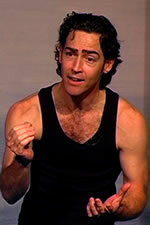 Part I earned critical and audience raves and packed the house during its original run in 2005. Thus, John was inspired to continue his exploration into his relationship, especially now that he and his wife had their baby and the new challenges that accompany such a bundle of joy. The result was Part II which Premiered for a 6 week run in 2009 at the Prestigeous Hudson Theatres, again earning John critical and audience raves. Fortson, who some call "the next Spalding Gray," was equally compelled to develop Loveswell (Part II) by legions of fans, as well as Silverman. "John’s gotten deeper and has gone to the next level," Silverman observes. "This new Loveswell is so great—poignant, funny, heart-opening and truthful. John is in his power as an actor and writer." In Part II, Fortson introduces parenting into the hilarious, but brutally honest script that allows the audience to peer behind closed doors as he struggles to balance the demands of marriage and fatherhood, all with the ocean and surfing as the backdrop. John likes to get personal! He shares, "When we share what really goes on in our lives, people listen because we are all trying to figure out the same thing. How does he do it? How does she? Even though you are a woman and I am a man or his name is George and mine is John we all have the same hopes, the same fears, dreams and loves. We all want to be loved. I think that both Loveswell shows, Part I & II have had such big draws and attracted such positive reviews because they are so personal. And that's why I believe that none of us have anything to hide. When we don't share we end up judging, when we do share we have empathy and grow closer together through our humanness and as a community. That's what I love about the intimacy of theatre. Good theatre helps us see ourselves. Helps us connect to what's really going on inside and causes rejoice in the revelation of awareness. It can stir our soul, which is good!" Floridian, John Fortson, was raised to value the world and people around him. Thus he has a profound love for life, people, animals and adventure. Probably due to his diverse background growing up on kind of farm by the river, carved out of the swamps of Palatka, FL by his grandfather and grandmother. His mother was an artist who loved to paint, garden, and rescue; taking care of anything she found. So it wasn’t unusual to find John growing seedlings or caring for everything from birds to rabbits to turtles to horses, you name it. But it was her gift for storytelling that had John captivated for hours, unknowingly planting the seed for his desire to become an actor. While attending the University of North Florida, John won a plum role opposite LOST's Emmy Winner Michael Emerson in Othello and also acted in many other local productions. Graduating with his BA in advertising, John interned at an advertising agency and might have stayed in the field had he not taken a seminar and caught the eye of a New York American Academy Teacher and Casting Director. She took him under her wing advising him, "You have to study, get your SAG card, and move to L.A." John did just that. John’s Film work garnered him a Best Leading Actor Accolade and his versatility continues to win diverse roles in Film and Television some of which include; his starring role in the 2011 Indie film, Spacechild, hitting festivals now, for which John grew a beard & lost weight portraying an astronaut regretting his solo 20 year mission to the end of our solar system, his Cary Grant-esque role in the Indie Film, Definite Maybe, as a Meth Addict on death's door saved by Maura Tierney in ER, with Jessica Biel in 7th Heaven, a scientist saving the world in the 24ish Indie Pilot, Beyond, the good brother in Lather, Rinse, Repeat opposite film steady Marshall Bell and Golden Globe Nominee Troy Garity, and co-starring in the intense relationship drama Magnetic Poles which was a Sundance Festival Selection. John began writing as a way to explore new challenging roles. Intrigued by relationships in his life, his work is extremely personal, funny and poignant and has led to invitations to write and perform for Six Feet Under Head Writer Jill Soloway's show, SitNSpin, for LA's MOCA Museum, and for the LA Comedy Festival. Over the last few years, John wrote and performed his most exciting project to date, LOVESWELL, a one person show about relationships for which he’s received critical and audience acclaim throughout Los Angeles. Loveswell is now in development as a feature film. John continues to surf, travel, and adventure; scuba diving, camping, hiking as many places as possible like Costa Rica, Oahu's The North Shore, Kauai,Australia, Mexico, Tahiti and more. He's also passionate about supporting a variety of charitable causes including: Project Save Our Surf, The Surfrider Foundation, Heal the Bay, Surf Aid International, and Cancer Research. In 2008 he and his wife, Actress Christie Lynn Smith, welcomed their daughter, Abby Ryder, into the world. John hopes to pass along the same values he was lucky enough to grow up with to her.